Fall is an excellent time for gardening! Summer vacations are complete, nights are cool, days are warm, there is morning and evening dew and the soil is warm. This is the perfect recipe for successful planting. 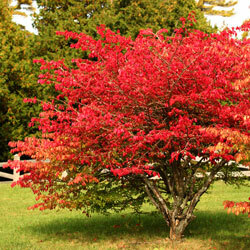 This time of year, many quality shrubs are available sporting the fantastic colors of fall. Add a few of these to the recipe and enjoy immediately. Heavenly Bamboo (Nandina domestica) – Choose from many varieties that reveal colors ranging from orange to fiery red to burgundy. Serviceberry (Amelanchier alnifolia) – Serviceberry is an attractive low-spreading shrub or small tree. The young branches and buds are reddish brown and smooth while the older twigs are gray. White flowers are plentiful, fragrant, and grouped in showy white clusters of 3-20 flowers. The fall berries are initially red, later ripening to dark purple. Viburnum (Viburnum species) – This genus of shrubs and small trees is a valued food source for birds and other wildlife. Most plants in this group are tolerant of wet soil and partial shade, and are useful as specimens or for informal hedge and screen plantings. For fruit production, it is best to set out two or more plants of a species and plant in a sunny location. ‘Highbush Cranberry’ is a popular upright shrub with maple-like leaves bearing showy clusters of white flowers in late spring, followed by bright red berries in fall. The berries often persist through much of the winter. Winter Berry Holly (Ilex verticillata) – Persistent red berries make this plant a standout for the winter landscape. Several selections like ‘Sparkleberry’ range in size from 3-14’ high by 4-8’ wide. Some tolerate wet feet and all selections are excellent for attracting birds to the landscape.